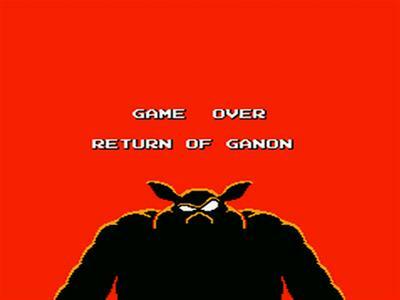 ‘The Legend of Zelda’ was a huge success in the 1980s. While I don’t think that the game has aged entirely well, I still cannot deny what an impact it had on the video game industry as a whole. 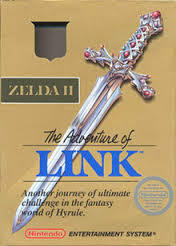 While it didn’t sell as many copies as ‘Super Mario Bros.’, ‘The Legend of Zelda’ managed to spawn a sequel and in celebration for the release of the latest game in the franchise, I am going to look back at this and the next ‘Zelda’ game. This is my review of ‘Zelda 2:The Adventure of Link’. Shortly after I beat the first ‘Zelda’ game, I grew a little curious about the sequel. I have heard many things about this game but I’ll save my opinions for later. As for now, let’s get on with it. 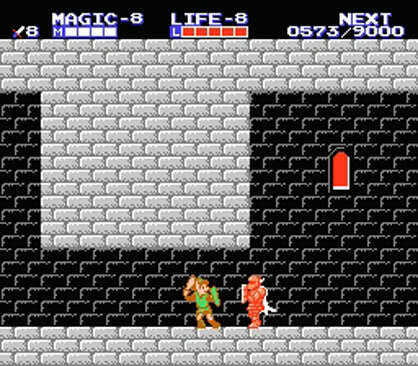 The story takes place a few years after the events of the first ‘Zelda’ game. Link and Zelda have grown up into young adults and Ganon is still dead. However a sleeping curse has befallen unto Zelda and Link needs to find the final piece of the Triforce of Courage to break the curse. If you recall from the last game, there were only two Triforce pieces within the game so this is the debut of the third piece. 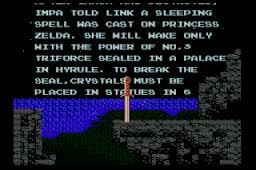 In order to get to the final piece however, Zelda’s servant, Impa, gives Link special stones and tells Link that he must travel to six temples across the land, place each stone in the statue of that temple and that will grant Link access to the Great Temple where the Triforce is located. Like the last game, there are no story elements besides the rolling text that plays when you leave the title screen running long enough and there are no in-game cutscenes or dialogue as you progress. This story is about as simple as the story in the last game and it’s nothing to be concerned about. In terms of gameplay, this game has a completely different style compared to the last game. Instead of an overhead adventure game, we now get a side-scrolling adventure game with some RPG elements. 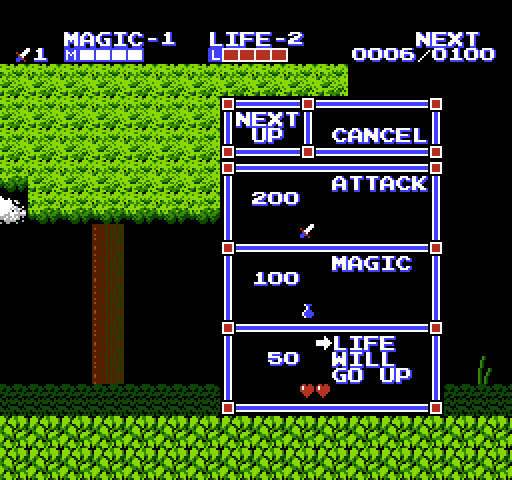 The A button allows Link to jump, the B button is used to stab, the D-Pad is used to move Link left and right, the Start button takes you to a menu where you can access your spells when you get them and the select button allows you to use the spell that you selected. The HUD at the top of the screen tells you how much experience points you have as well as your health meter and the new magic meter which shows you how much magic you have to use a spell. When you are at full health, Link can shoot a beam from his sword like he could in the last game which is good, but it doesn’t do any damage to bigger enemies. The RPG elements of this game are pretty simple. Each time you kill an enemy, you earn experience points and if you gain enough, you level up. When you level up, you can earn more health points for your health meter which allows you to take more hits, more magic points for your magic meter which can also reduce the point cost for some of your spells and finally strengthen the power of you sword which allows you to kill enemies faster. Besides walking around the screen, Link can also travel on the over-world map where he visit towns or find his way to the temple. You may even encounter some secrets along the way such as heart containers which permanently extends your health meter, a potion which can extend your magic meter or even extra lifes. The towns are where you can talk to people to obtain hints about where items are and where you can obtain the spells. However the information they give you can range from cryptic to downright worthless. 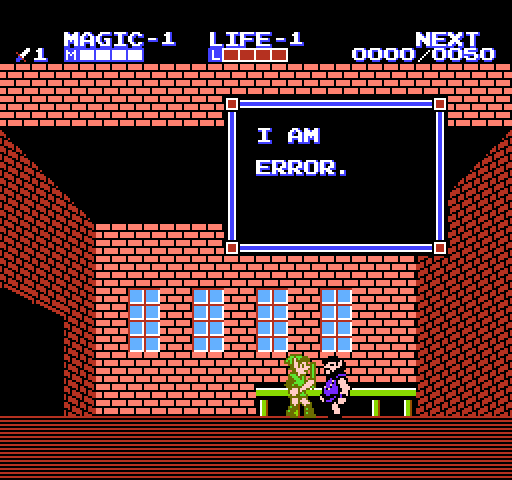 The most famous is one man who says ‘I am Error’ (which I find both worthless and a little amusing at the same time). Some people can offer more coherent hints, but I still recommend using a guide or a map to know where you are going. 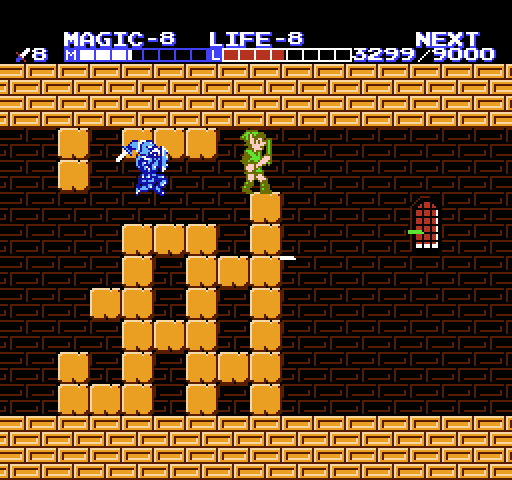 Like the last game, ‘Zelda 2’ doesn’t have a good map function. In fact, it doesn’t have any map whatsoever. The over-world map is better to look at this time around and the game is nowhere near as non-linear as the last game mostly because you need the palace items in order to progress, but I think that first-time players should definitely bring a guide for this one. The spells you obtain across Hyrule are very useful and I seriously recommend getting them. There are some spells that require completing certain tasks in order to get to them, but some of these spells are required to beat the game. The first spell you get is the Shield spell which is used to reduce damage you take from enemies until you leave the screen. The Jump spell allows you to jump higher which is needed to explore more of Hyrule. The Life spell heals your health and is probably the most valuable spell in the game but it costs so much magic to use. 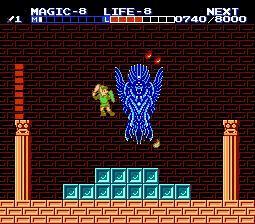 The Fairy spell allows Link to turn into a fairy and lets him fly across the screen which is required to get to certain places and you cannot transform back into Link until you leave the screen. The Fire spell lets you shoot fire from your sword. 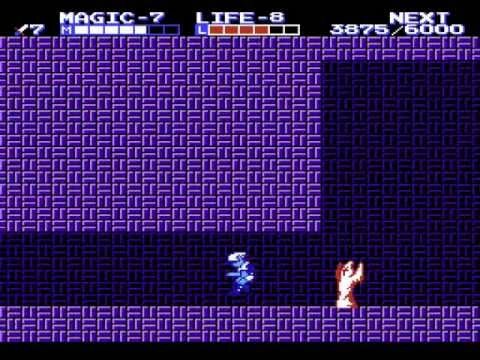 The Reflect spell allows you to bounce back certain magical projectiles and is required to beat the boss at the fourth palace. The Spell spell (yes that is what it is called) reveals a secret palace in New Kausto Town and can transform enemies into smaller enemies that are easier to kill. The final spell, The Thunder spell, is a screen nuke. That sounds awesome, but it costs much more magic to use than the Life spell. You are better off using your magic for the Shield and Life spells to hold out as much as you can. The objective of the game is simple. You have to travel through the temples, get the secret item inside which you need in order to progress with the game, beat the boss at the end of each temple and place the stones in each altar. You start off with three lifes and along the way you have to fight Ganon’s followers who want to kill Link and use his blood to resurrect Ganon from his ashes (kinda morbid don’t you think?). Let me make this clear to you now. This game is hard, this game will challenge you and you will die A LOT. One of the reasons why this game is difficult is because of some of the enemies you will encounter. The enemies at the beginning of the game are really easy to take down, but the enemies you will encounter will give you loads of trouble. 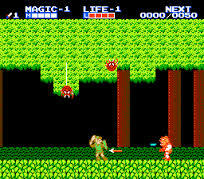 In the first and second temples, some of the enemies you will encounter are Iron Knuckles which do a lot of damage and can block any attack except for a well-timed jump stab and the red devil looking creatures that throw maces at you which remind me of Hammer Bros. from ‘Super Mario Bros.’. The first and second temples aren’t too bad, but the difficulty spike doesn’t start until you reach Death Mountain, where you have to fight these lizards armed with axes that not only can take a lot of hits, but can deal quite a lot of damage. When you die, you lose a life and you start again in the area that you died in with your health and magic fully restored, which I appreciate. However if you get a game over, you start back at Hyrule Temple where you have to journey back to the temple that you died at. You do keep any items that you got along the way as well as the upgrades that you earned through levelling up, but the fact that you have to start over from Hyrule Temple again is absolute horse manure. You need to grind for experience points if you plan on surviving the second half of the game where enemies and level design get more and more hectic. 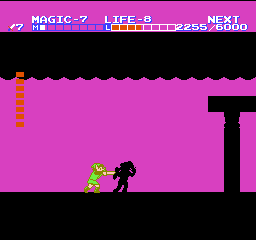 You’ve got dragon heads that act like the Medusa Heads in the classic Castlevania series that hover around bottomless pits, stronger variations of Iron Knuckles and you even fight KKK members that teleport and throw magical waves at you (That is not a joke). The game isn’t over when you complete all six palaces. You have to travel to the Great Temple to truly finish the game. The journey to the Great Palace can be a frustrating experiences because not only do you have to deal with lizards that are pretty much pimped out Iron Knuckles, you have to deal with floating eyeballs that hover around bottomless pits and if you get a game over trying to accomplish this, you have to travel through all of this garbage again. Thankfully when you do get to the Great Palace, you start back at the beginning of the Great Palace which I appreciate but it makes me wonder why they didn’t do this for all of the other palaces. The Great Palace is an area that you definitely need a guide for because just like Ganon’s dungeon from the last game, it is GINORMOUS. It has too many rooms, too many dead ends and loads of ways to die. I have never traversed through this area without using a guide and I suggest you do the same. The enemies here are relentless. You got dancing birds that spit fire and my most hated enemy in the game, bird knights that block attacks and they keep jumping everywhere. If you do manage to get to the end of the Great Palace, you fight a giant monster called the Thunder Bird (what does that remind you of?) which you can only damage if you use the Thunder spell on it first. It deals so much damage even when you have the shield spell active and you will also need to have the Jump and Reflect spells active in order to have an easier time against it which will leave you with very little magic points for the true final boss of the game. If you thought the final boss was the Thunder Bird, you are dead wrong. After defeating Thunder Bird and going to the next room, a small old man with the Triforce will present you with one final test (because all that we have gone through before somehow did not prove our courage). You have to fight your shadow A.K.A Dark Link. The main problem with him is he makes nearly every move that you make and because of that it can be really hard to get a hit on him. You have to hit him eight times to beat him. There is another way to beat him but everybody else has already discussed that. After defeating Dark Link, the old fart will give you the Triforce of Courage which awakens Zelda from her cursed sleep ending the game. For an 8-bit game, it is visually pleasing. The sprite work is pretty good, the colours aren’t painful to look at and they manage to stick out from each other. I will say that the map looks very blocky for my taste but it does contain set pieces that you can remember throughout your journey. The soundtrack for this game is great. There may only be a few tracks in this game (which is kind of expected for an NES game) but they are really memorable. I do enjoy the Temple theme, the battle themes and Dark Link’s theme which is simple but it’s still really good. For a game that can be really difficult the further you progress, I am glad that the control is pretty good. Link’s jump ark is fluent without being too stiff, he is responsive to button inputs and there isn’t that much delay when he attacks. There are a couple of negatives that I can point out such as his traction which can lead you to slide into enemies but it isn’t too bad. The other negative is knock-back when he gets hit which can potentially kill you when you are near a bottomless pit which can really be irritating. Overall I can definitely see why many people consider this the hardest game in the franchise. It may not be the hardest game I have ever played but I would consider this to be in my list of most difficult games I have ever played. Not only will you need a guide to know where you need to go next, but also need to bring your A game in order to get past the garbage moments. But in my honest opinion…I did actually enjoy this game much more than I did with the first Zelda game. In fact I will go and say that I had an easier time with this game than I did with ‘Super Mario Bros. 2 The Lost Levels’. I will admit that it is teeth grindingly hard, but besides the trip to the Great Palace and death by knock-back, I didn’t find anything that I would call cheap. It doesn’t throw hordes of hard-to-beat enemies at you and it doesn’t ask you to achieve ridiculous feats like Lost Levels did. I think that the combat is much more thrilling and entertaining than the last game and I do love the feeling of getting stronger as you progress. I was expecting to have a hard time with this game when I first started playing it and there were times where I did get a little frustrated, but it wasn’t as bad as I thought it was going to be. So overall, if you are looking for challenge, I do recommend giving this game a try as it is the most difficult Zelda game I have played so far. See how you like or hate it.